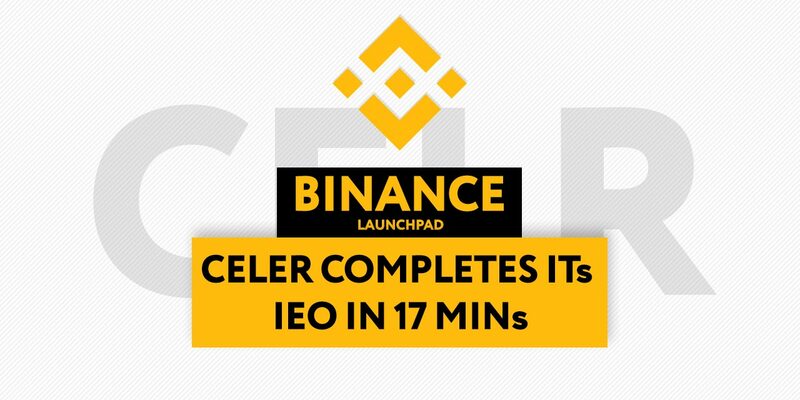 Binance Launchpad has broken yet more records following Celer Network’s (CELR) completed token sale within 17 minutes and 35 seconds. Their Launchpad continues to exceed expectations and hoas done so again in its third initial offering. According to reports, the hard cap for the CELR token sale was at approximately $4 million, but participants could only purchase the tokens with Binance Coin BNB, -1.05% at a fixed price. During the sale, one CELR token was priced at 0.000434 BNB. This allowed users with 1 BNB to purchase 2,303.35821 CELR tokens. The minimum amount eligible for purchasing was 2985.074626865672 CELR. The maximum amount eligible for purchase was 223,880.597 CELR tokens. Binance CEO, Changpeng Zhao, did stress his upset at not all customers getting the Celer coins. In a tweet he said, “39003 people tried to buy, 3129 people got some. 35000 people will be somewhat unhappy”. So, it would appear that it was not all rosy for Binance as only one in ten was able to Celer tokens, but CZ looked to assure users that the problem would be fixed in an upgrade. However, overall this is yet another big moment for Binance, who have been making news throughout the week as the DEX exchange platform looks imminent and talks of further decentralisationgrows.